Dr. Pelto's Blog: Broken styloid process, what to do? Broken styloid process, what to do? 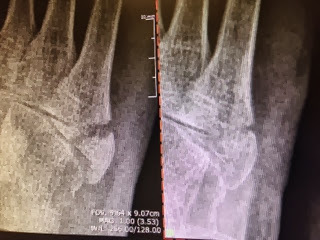 Here are comparison x-rays from a patient from an initial injury of the 5th metatarsal with a fracture and about 6 weeks later with the healing. You can see how there is healing across the break and she will start walking on the foot. Usual time of healing is 6-8 weeks but what is challenging in this issue is the pull of the peroneus brevis tendon on that area of the bone. This can cause movement of the fragment and delaying healing. If you found this helpful and would like to learn more about your foot condition please check out this Foot Pain Toolkit loaded with resources. Click HERE.